Cells are the ultimate ensemble cast members, but they can also deliver soliloquies—if the cells ever get the chance to have the stage to themselves. 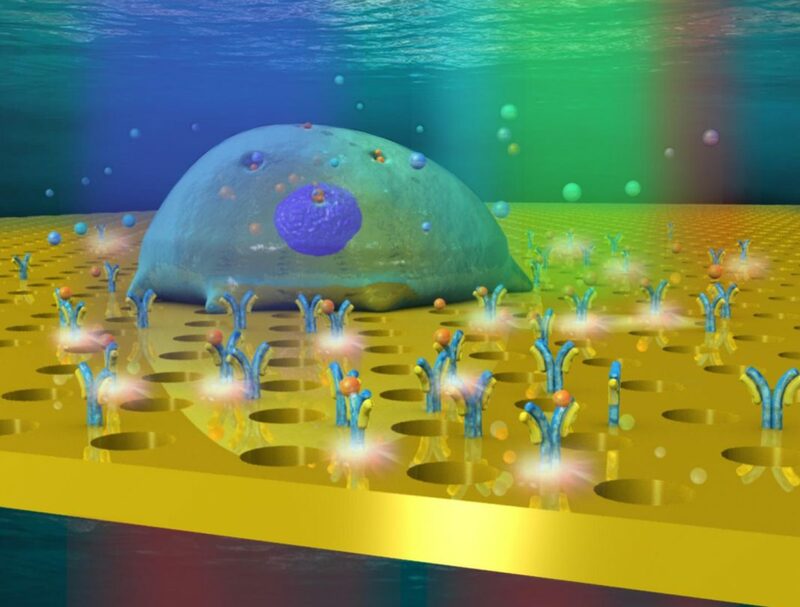 To give individual cells their turn in the spotlight, an international team of scientists has built a sort of microfluidic theatre, complete with a gold-coated glass stage and a nanoplasmonic lighting system. With the right stage management, individual cells can be induced to reveal their innermost motivations, the signals they would transmit to other cells while playing their parts—heroic or otherwise—in dramas as varied as infection, immune disorders, inflammation, sepsis, and cancer. By listening intently to cells and designing the appropriate therapeutic interventions, scientists may be able to direct cellular actors toward happier endings. That’s the hope that has been expressed by scientists based at RMIT University in Australia, École polytechnique fédérale de Lausanne (EPFL), and Ludwig Institute for Cancer Research in Lausanne. These scientists reported that they have developed an optofluidic device that contains a chamber that is around one one-thousandth the size of a raindrop. The chamber accepts a single cell, which may then be observed in real time while its environment remains undisturbed by molecular labels, which are common in other venues such as fluorescence- and colorimetric-based systems, and which tend to interfere with cell integrity and compromise temporal resolution. Without these distractions, a cell’s chemical secretions come through more clearly and continuously. Details appeared May 28 in the journal small, in an article entitled “Label-Free Optofluidic Nanobiosensor Enables Real-Time Analysis of Single-Cell Cytokine Secretion.” This article describes what happened after the cellular casting call went out to single lymphoma cells, which were evaluated for cytokine secretion, which the scientists noted, must be monitored if the heterogeneity of cellular functionalities is to be understood, and if novel therapies for multiple diseases are to be developed. The biosensor was shown to work for 12 hours straight, but it could, the authors argued, function much longer, offering researchers a powerful and innovative selection tool. The nanophotonic biosensor developed by the researchers is a glass slide coated with a thin gold film, perforated with billions of nanopores arranged in a precise pattern. A small chamber, whose walls are made of porous membranes, is placed above the slide. 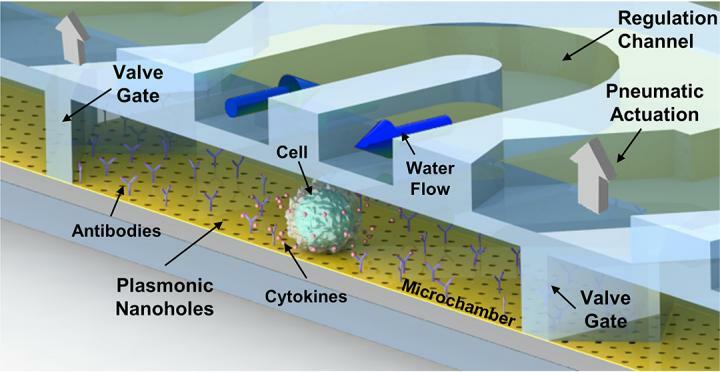 The chamber receives a steady flow of water and nutrients through tiny microfluidic channels. Temperature and humidity are carefully regulated. The device contains valves that let scientists insert a cell into the chamber, in which ligands or antibodies are positioned to recognize and capture specific molecules secreted by the cell. Developed by the Australian–Swiss research team, the technology offers researchers unprecedented insights into how individual cells behave—something that scientists are discovering is far more complex than previously thought. “We know a lot about how groups of cells communicate to fight disease or respond to infections but we still have a lot to learn about individual cells,” said Arnan Mitchell, Ph.D., director of RMIT's MicroNano Research Facility. “Studies have recently shown that you can take two cells of the same type and give them the same treatment, but they will respond very differently. “We don't know enough about the underlying mechanisms to understand why this happens and we don't have the right technologies to help scientists figure it out. Our solution to this challenge is a complete package—an integrated optofluidic biosensor that can isolate single cells and monitor the chemicals they produce in real-time over at least 12 hours. The new biosensor has many potential applications. For example, it could be used to identify the most aggressive cancer cells in a tumor and decide exactly which treatment to administer to the patient.